The Meanwhile Bar presents the film "1984" on April 4 as part of the Meanwhile Film Series at Wealthy Theatre. This event is part of the National April 4 screening of 1984 at Art House theaters around the country. This date was chosen because it's the day George Orwell's protagonist Winston Smith begins rebelling against his oppressive government by keeping a forbidden diary. These screenings are meant to express support for the National Endowment for the Arts and to call any attempt to scuttle that program as an attack on free speech and creative expression. 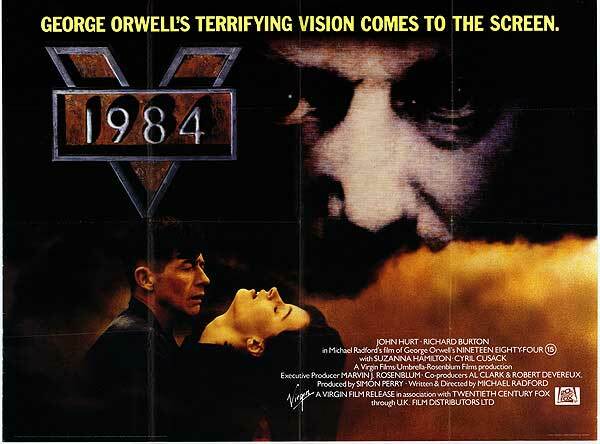 "1984" is directed by Michael Radford and starring John Hurt, Richard Burton, and Suzanna Hamilton. If you are a member of the Community Media Center, you can order drinks at our bar and enjoy a local Michigan beer, a glass of wine, or a mixed drink while watching your favorite cult classics from the 70's, 80's and 90's. Remember, bar privileges are available only to CMC Members. If you would like to learn more about the many benefits of CMC membership, please click here. If you have suggestions and/or comments about upcoming film titles, contact tom@grcmc.org.